The doors open at 6:30pm, and the concert will begin at 8:00pm. Feel free to bring a snack to share and a beverage if you arrive early. There is seating for about 25 guests. Suggested donation for the entertainers is $25.00. Alan Reid was a founding member of Scotland's legendary folk group Battlefield Band from its inception in 1969 till his departure in 2010. The 'Batties' have been pre-eminent in Scottish music for decades, touring the world and recording 30+ albums. Their music has won awards in the UK, Germany and the USA. Alan was crucial in the band's evolution as singer and player, being the first to use keyboards as an integral element in a traditional folk band. His influence and the band's can be heard in many of today's Celtic musicians. His songs are noted for their lyricism, strong melody and storytelling and have been an important component of the band repertoire. Since 2000 when his partnership with Rob began, Alan's reputation has been enhanced by his involvement in Linn Records' mammoth 12 CD series of the Complete Songs of Robert Burns and his nomination as composer of the year at the Scots Tradition Awards in 2009. As well as all the recordings with Battlefield band and Rob, Alan has released 2 solo albums, The Sunlit Eye and Recollection, and a songbook 'Martyrs, Rogues and Worthies'. He has also collaborated with Virginia singer and multi-instrumentalist Bob Zentz and occasionally performs solo. Netherlands born Rob van Sante is an accomplished guitarist and singer. He began playing at an early age, absorbing music styles of all genres and incorporating them into his playing styles. In the 1970s, 80s and 90s he worked with a variety of well known English and Celtic musicians, touring extensively in Europe as well as North Africa and the Middle East and eventually putting down roots in Leeds in the north of England. It was at this time he came in contact with Alan and Battlefield Band and was recruited as their sound engineer and unofficial 'fifth' member and continued in that role until 2010. Acknowledged for his subtle guitar accompaniments and fine harmony singing Rob is also a noted producer, recording engineer and session musician. 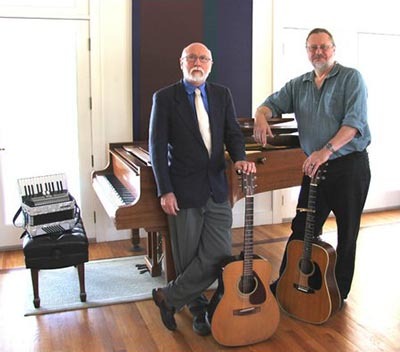 Outside of the duo with Alan, he records and plays with veteran singer and songwriter John Conolly, writer of classic folk standard 'Fiddlers' Green' and also with U.S. songwriter Janie Meneely. Alan and Rob will also be playing new material from their newest album The Dear Green Place, which tells of the origins and history of Glasgow.